Cauliflower is in season in the winter months. Whole Foods Grocery had beautiful and huge cauliflower on sale. I purchased several for my recipe trials. I believe that cauliflower is one of those vegetables that you “learn to like.” It seems to be an acquired a taste; the more you eat it the more you like it. 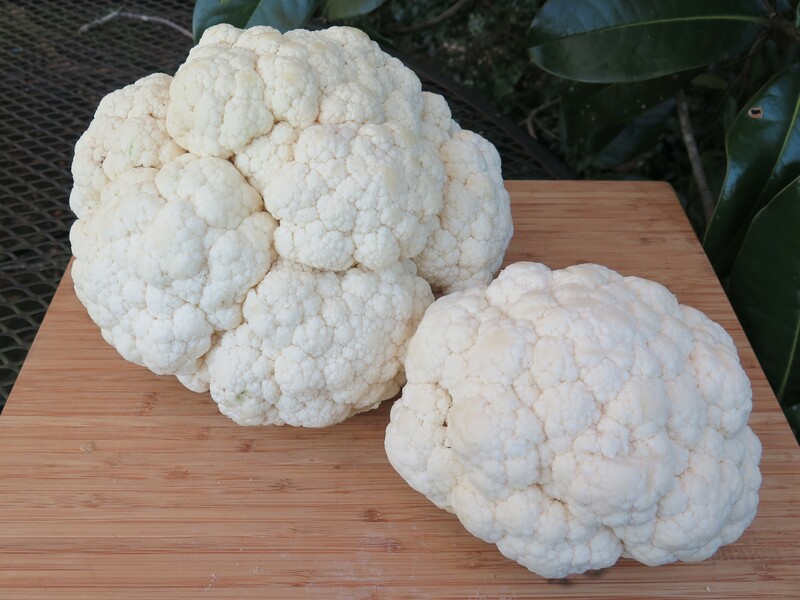 I learned to like this vegetable when it was served as a deep-fried cauliflower preparation a cafeteria line. P.F. 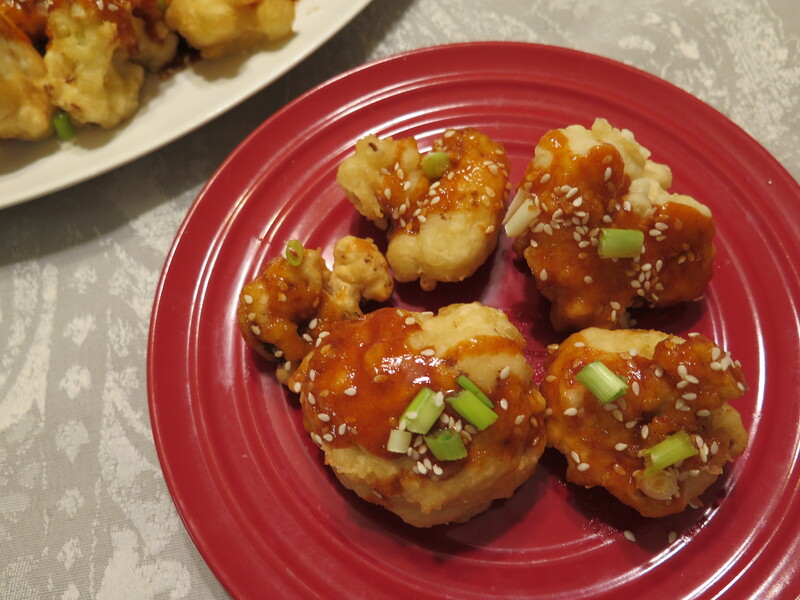 Chang’s Cauliflower Tempura recipe brings back memories of those years when I lived and worked in Michigan. Duplicating the P.F. Chang’s preparation at home is harder than it appears. I couldn’t find their recipe for Cauliflower Tempura on the internet, so I had to guess about how to make it. 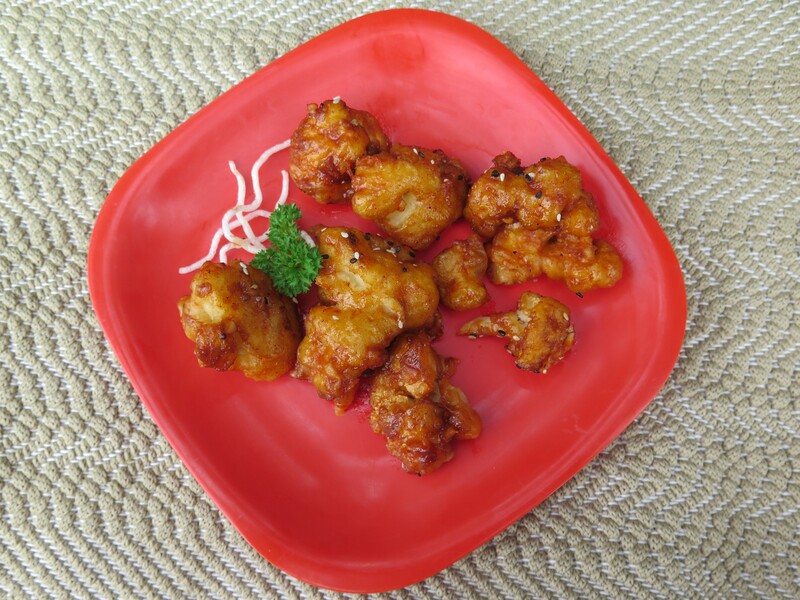 The cauliflower looks like it has a tempura batter which is deep-fat fried and topped with a sweet and spicy Gochujang or Korean sauce. P.F. Chang’s restaurants use woks for much of their food preparation. The woks are heated to a very high temperature, the fresh vegetables and other ingredients are added, tossed and cooked. This involves alot of skill and technique and I am pretty sure I didn’t want to attempt this at home. 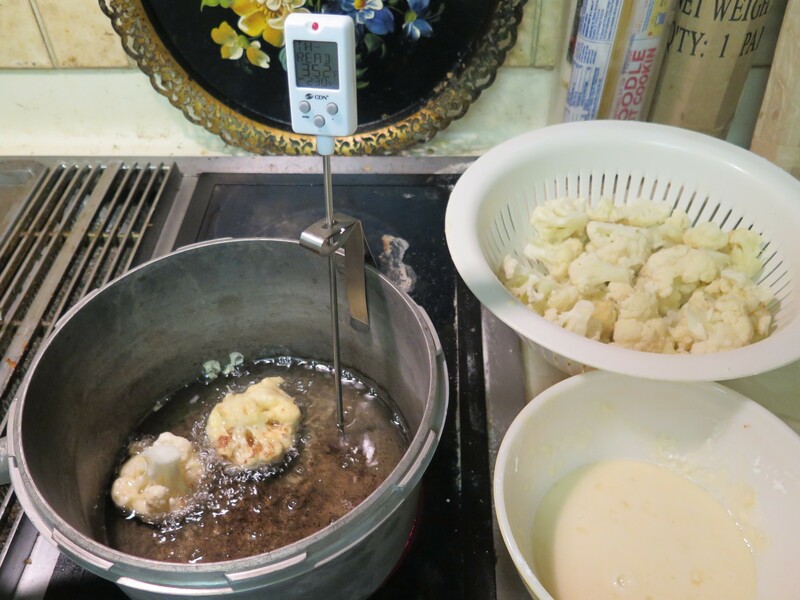 And how does it work to bread and deep-fry cauliflower in a wok? They must use deep-fat fryers, too. I tried roasting the cauliflower – with and without a batter — and topping it with a sweet and spicy sauce. The result was delicious but it didn’t have the crunchy tempera coating. So it seems like frying the cauliflower in a tempura batter is the way to go, although I don’t deep-fry very much these days. Here is my tempura cauliflower. Looks like the real thing! Luckily, I figured out how to make a tempura batter on my first trial by combining several recipes I found on the internet. Yeah! My recipe is modified to make an easy, straight-forward recipe. For my tempura batter, I used flour, cornstarch, baking powder, salt, an egg and ice water. Cornstarch is added so the batter won’t burn as easily. Often cake flour, lower in gluten, is used so the batter won’t be tough. (I used all purpose flour.) In any case, don’t over mix the batter–it is okay if the batter has lumps. 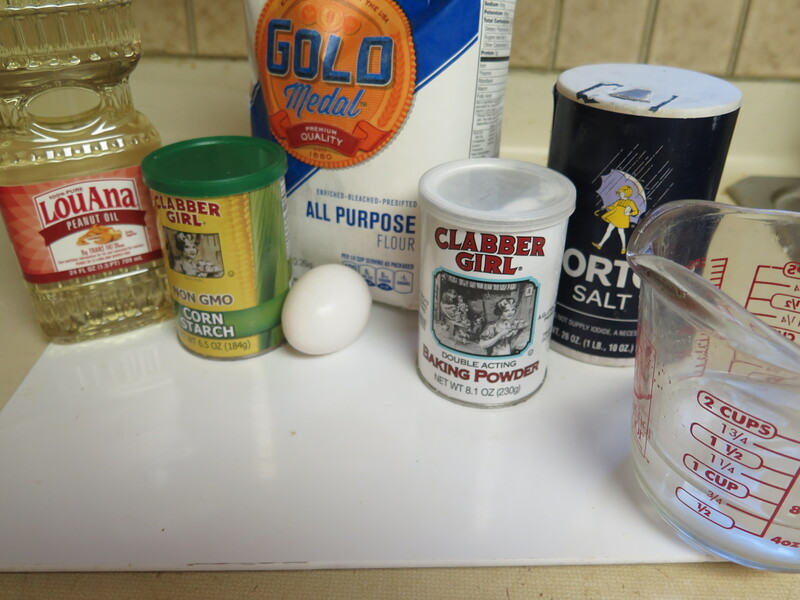 Many recipes included only egg yolks — I used the entire egg. To make the tempura batter, sift together the flour, cornstarch, baking powder and salt. Make a well in the center, add the beaten egg and 1/2 cup ice water. Stir as little as possible and use immediately. Add more ice water or more flour to get the right consistency — not too thick or runny — it should slide off a spoon but not run off the spoon. For frying, I used peanut oil because this can be heated to a high temperature without smoking. Using a thermometer to keep the oil at 350 degrees is important and removes the guess work from heating oil. The batter will burn if the oil is too hot and the batter won’t cook if the oil is too cool. I love this digital thermometer and keep it handy in my counter-top container of kitchen gadgets. I debated about using raw cauliflower florets vs blanched ones; and finally decided to cook the cauliflower slightly before frying. There really isn’t enough time during the frying process to adequately cook the cauliflower. The microwave oven worked well to blanch the cauliflower florets until they were tender but still crisp–this took eight minutes. Frying the cauliflower florets turned out to be easier than I had imagined. The tempura batter adhered to the cauliflower florets. I dipped individual florets in the tempura batter and fried them for several minutes, turning once, adjusting the heat on the stove to keep the oil close to 350 degrees. Here’s my fried cauliflower. The other crucial part of this appetizer is the sweet and spicy sauce. P.F. 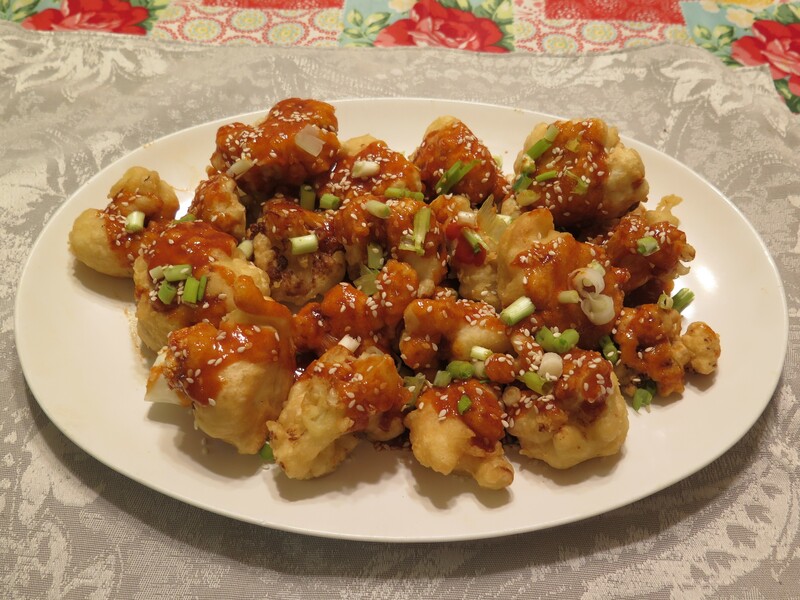 Chang’s cauliflower appetizer is coated with Gochujang Sauce. This is a very hot Korean sauce made from red chili peppers and gelatinous rice. It is usually thinned with other ingredients since it is mighty strong if used straight from the container. I really didn’t care for Gochujang Sauce made at home with Korean red chili paste. Instead, I much preferred a sauce made with Sriracha. This sauce originated in Thailand and is also made with red chili peppers. I thinned the Srirachi with soy sauce, rice vinegar, ginger, garlic powder, sesame oil and of course, sugar. Carefully brush or spoon the sauce on the delicate cauliflower. Top with sesame seeds and green onion slivers. Pass additional sauce for dipping. My Cauliflower Tempura is a close duplicate to the one from P.F. Chang’s. Perhaps even better! My family loved it and I am very proud of being able to figure it out. And my recipe actually isn’t that difficult to make. But lucky for us, a P.F. Chang’s Restaurant is just around the corner for those occasions when we want to enjoy their wonderful food and atmosphere. Remove stem from cauliflower and carefully cut in to small florets. Place florets in a single layer in microwavable container, add 1/4 cup water, cover loosely and blanch for about 8 minutes until tender crisp. Alternately, add florets to medium pot, add 1/2 cup water. Bring to boil and then lower temperature to simmer until tender crisp, about 5 minutes. Add peanut oil to Dutch oven or heavy pot to a depth of several inches. Increase stove burner setting to medium-high bring oil to 350 degrees using thermometer. Adjust heat of stove burner to keep temperature of oil steady. Made tempura batter: sift flour, cornstarch, baking powder and salt together. Place in medium sized bowl. Make a well in center, add beaten egg and 3/4 cup ice water. Stir with spoon until just combined; some lumps may be present. If too thick add additional ice water. Batter should slide off spoon, but not run off spoon. Add flour, a spoonful at at time, if too thin. Use immediately. Dip cauliflower florets in tempura batter, one at a time, shake off excess batter. Place in hot oil, working in small batches as space allows in Dutch oven or heavy pot. Fry florets several minutes on one side; turn to fry second side, about 5 minutes total. Adjust heat to keep oil at 350 degrees. Remove to plate lined with paper towels, continue to fry small batches at a time until all florets are fried. 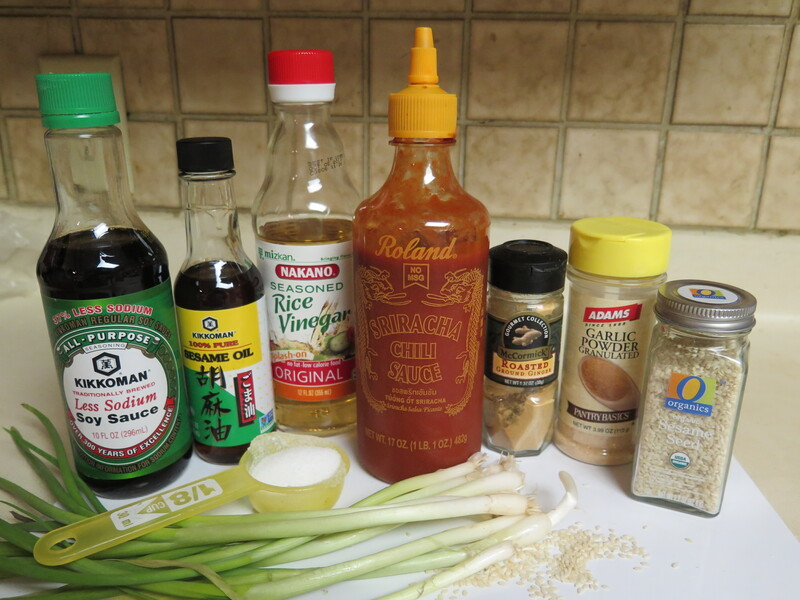 Make Sweet and Spicy Sriracha Sauce: combine soy sauce, rice vinegar, sugar, garlic powder and ground ginger in small sauce pan. Bring to boil and stir just until sugar dissolves. Remove from heat and stir in sriracha sauce and sesame oil. 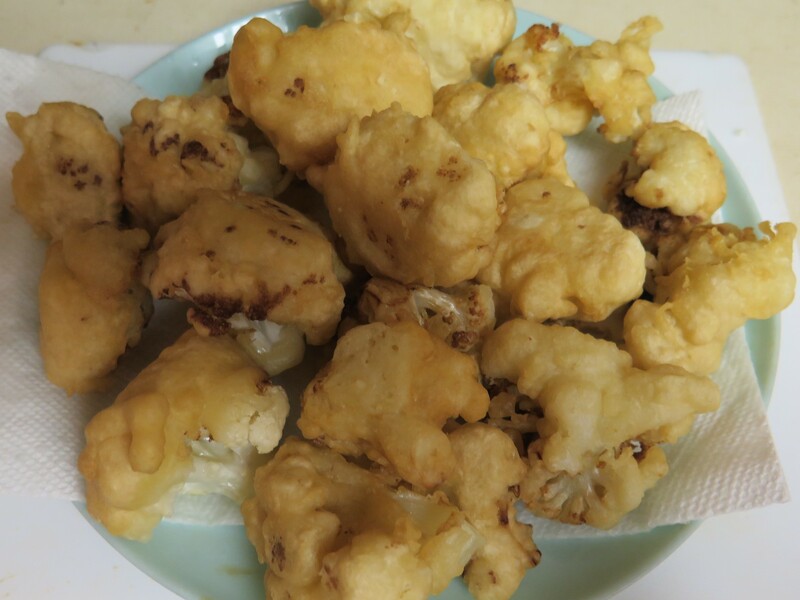 Transfer fried cauliflower to serving dish. Use spoon or pastry brush to coat cauliflower pieces with some of the sauce. Pass remainder of sauce as a dipping sauce. Top cauliflower with sesame seeds and green onion slices. This entry was posted in Recipes and tagged cauliflower, cauliflower tempora, kitchen gadgets, P.F. Chang's Restaurant, Sriracha sauce, sweet and spicy Korean sauce by Maylee at Beyond Gumbo. Bookmark the permalink.